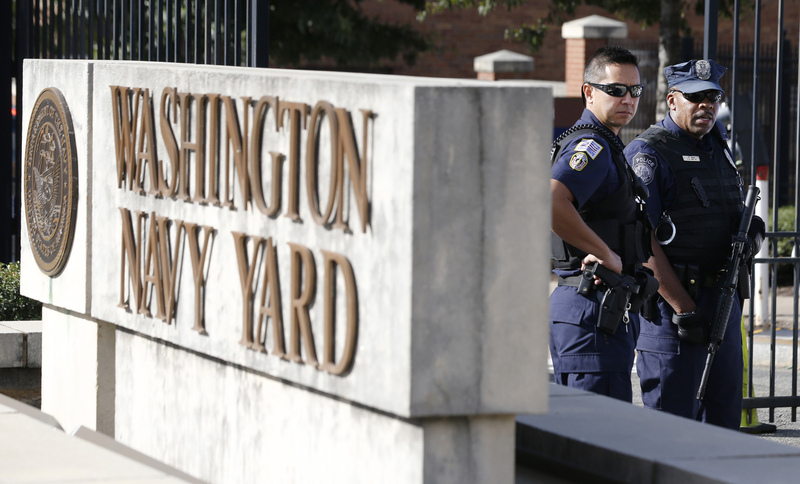 The Navy Yard Shooting: What Does It Mean for Military-Base Security? Washington authorities are questioning how and why a man with a troubling history was granted access to a military installation. Navy Secretary Ray Mabus on Tuesday ordered a “rapid review” of all Navy and Marine facility security procedures in the wake of Monday’s shootings at the Washington Navy Yard that killed 13 people, including the gunman. Defense Secretary Chuck Hagel on Tuesday said he is meeting with military service chiefs to determine parameters of a worldwide review of all the department’s installations. The Navy effort, to be completed by Oct. 1, will be led by Adm. William Gortney, commander of the U.S. Fleet Forces Command, and Lt. Gen. Rick Tryon, commander of the Marine Corps Forces Command. The moves come as questions about the penetration of Navy Yard security are being raised by lawmakers, the Defense inspector general, a union representing federal building protection employees and security analysts. They are demanding inquiries into how a 34-year-old Navy information technology contractor identified as Aaron Alexis, now deceased, entered the workplace of Naval Sea Systems Command employees carrying three weapons. Also on Tuesday, the Pentagon restricted access to the Navy Yard to mission-essential personnel as the FBI continued its investigation into the seemingly random killings. The Navy issued an "Order to Account" to confirm the safety of all Navy uniformed personnel, both active-duty and selected reserve, assigned to commands in the metropolitan Washington area as well as Navy civilian employees, family members of servicepeople and Navy exchange personnel. The audit examined the effectiveness of the Navy Installations Command’s Access Control System vetting software called RapidGate, which was implemented by a service provider called Eid Passport Inc. The vetting software allowed contractors and others to gain temporary access to facilities. Auditors found, for example, that many of the provider’s checks on individuals seeking access were performed only on local, not national databases. Commanding officers of bases were given discretion to grant waivers to some contractors who failed the public records check if they determined that the contractors presented a reasonable risk. The audit was released a day after Rep. Mike Turner, R- Ohio, chairman of the House Armed Services Subcommittee on Tactical Air and Land Forces, on Monday wrote to acting Defense Inspector General Lynne Halbrooks demanding an urgent briefing on the then-unreleased audit. “I am highly concerned that the access control systems at our nation’s military installations have serious security flaws,” Turner said. The report had been announced in the IG’s August newsletter and was already “in the pipeline” for release when the Navy Yard shooting occurred, IG spokeswoman Bridget Serchak told Government Executive. The notion that Navy Yard security lapses may have been a product of sequestration was raised by District of Columbia Mayor Vincent Gray in a CNN interview on Tuesday. He said he was examining “how we somehow skimped on what would be available for projects like this and then we put people at risk…. It really is hard to believe that someone with a record as checkered as this man could get credentials to be able to get on the base,” Gray said, according to a Washington Times report. Wright said there remains some confusion about the Federal Protective Service’s role given that the agency works at 9,000 federal buildings and is funded not through an appropriation but through agency fees collected by the General Services Administration. GSA ran the service before the Sept. 11, 2001, terrorist attacks, after which it was moved to the Homeland Security Department. GSA in the 1980s had turned such protective services for Defense agencies over to Pentagon control. “Technically we should not respond to [incidents at Defense facilities],” Wright, an inspector, continued. “But our guys did the right thing by going in,” especially since the DHS National Capital Region office and the Transportation Department are nearby. “If I’m on the road and I hear a call from any federal building, the last thing I’m worried about is the GSA,” he said. “The problem is the Monday Morning quarterbacks.” He said he hopes DHS will clarify the situation. After the 2009 shootings at Ft. Hood, Texas, by an Army psychiatrist killing his own colleagues, the Defense Department released an independent report on lessons learned. It recommended that bases develop information sharing capabilities to police access by inappropriate personnel on a more timely basis. It noted, for example, that computer systems do not allow the services to share information on registered users and persons debarred from particular installations, and that overseas installations do not have access to the National Crime Information Center or the Terrorist Screening Database.